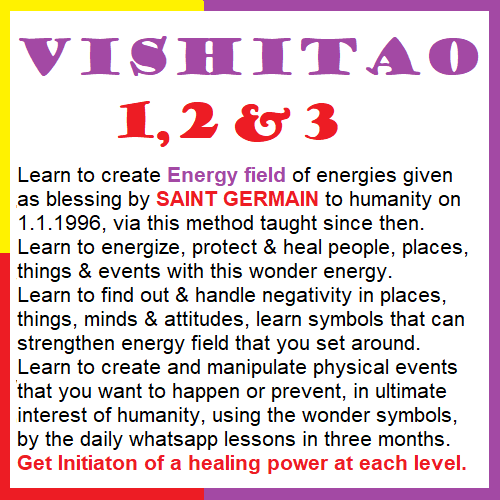 VISHITAO is a method of healing events and persons with the help of energized energy field. Here, one first creates an energy field, then visualizes his desired event in it, and then energizes it with necessary delineations put on that field in the necessary order. This is THE ONLY HEALING METHOD in the entire energy as well as the non-energy healing fields practiced throught out Globe, where TOUCHING A PATIENT by the practitioner DURING TREATMENT OR DIAGNOSIS is NOT AT ALL required. The complete diagnosis and healing of a patient or event or situation or relationship happens here, just by a technique of distance healing done after a simple breathing method. 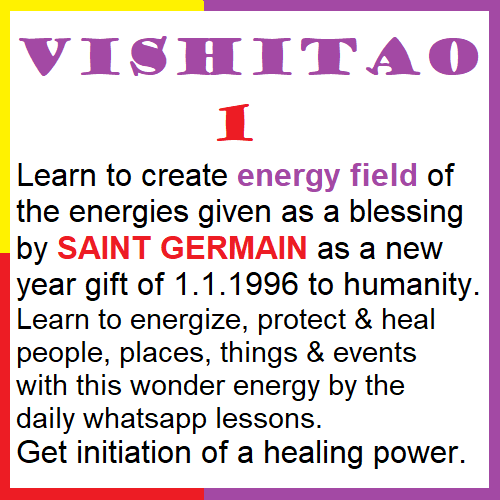 The first class of VISHITAO was conducted on 1.1.1996. Ever since that day, every year, on the 1st January, class of Vishitao is being conducted. This simple method of healing has shifted many lives since 1996. 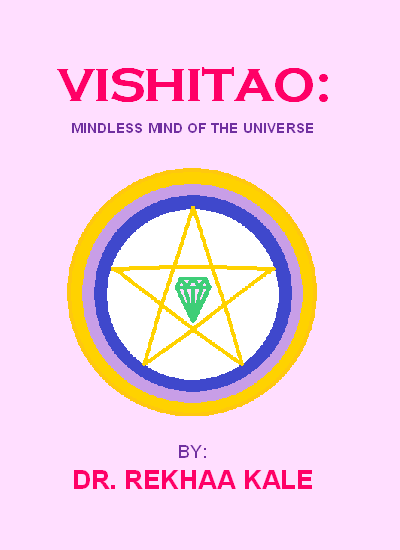 The best part of Vishitao is that it never produces any adverse results or supports any intention meant to harm anyone. The energy field produces harmony and well being in any area about which one is putting any intention. Also, if the intention of sender is totally negative, and if the sender wants to harm anyone, then energy field gives indication to the sender that intention needs to be revised. Only after the intention is revised and the intention is presented as beneficial & positive for the sender without mentioning any negative thing for any one, energy field starts working. So, we can say that this is an absolutely safe method that anyone can use without any risk of mistake and adverse or side effect. VISHITAO is taught in 4 different levels. Some seekers learn these levels one by one with breaks as per their convenience. Some learn all these levels together in a three day workshop. The first is the basic level that teaches the healer how to create and energize the energy field. Here, a healer learns two delineations or energy Mandalas that produce healing. With this level, one can start healing many people, situations and events that one learns to heal in many other healing methods. But here, he finds that speed of healing is much more accelerated. The second level is mental level of healing. Here, healer learns six delineations or energy Mandalas that produce healing. With this level, one understands the mind-body relationship, mental blocks and their power to create negative events and prevent goodluck, reasons of having these mental blocks and ways of counselling to let a person know of them and handle them, along with developing the ability to work on events to be created or enhanced but still depend on mental readiness for manifestation. The third level is material level of healing. This stage is a step above other known healing methods. Here we work on actual physical events and change them, like changing the temperature around us, reducing the swelling on any body part etc. Here, a healer learns twelve delineations or energy Mandalas that produce healing. With this level, one starts working on material level of events. The fourth level is spiritual level of healing. Here, a healer learns five delineations or energy Mandalas that produce healing. This level enables a person not just to achieve good spiritual progress, but also to reach the state of liberation in right sense, very much in ones own life time. So, after learning this level, one knows how to conquer one's own being and in turn how to conquer things around, by dropping all attachments. Of course, even the attachment to conquer drops off here, and eventually a person emerges as an invincible unstoppable winner. With this level, one is also known as a vishitao master. Here one learns how to diagnose the problem, how to reach the root cause of the problem, and then how to handle it to produce healing. One can learn all these four levels of Vishitao can be learned one by one as per convenience or can be learned together in continuation in a 4 day workshop as announced by Multiversity of success. 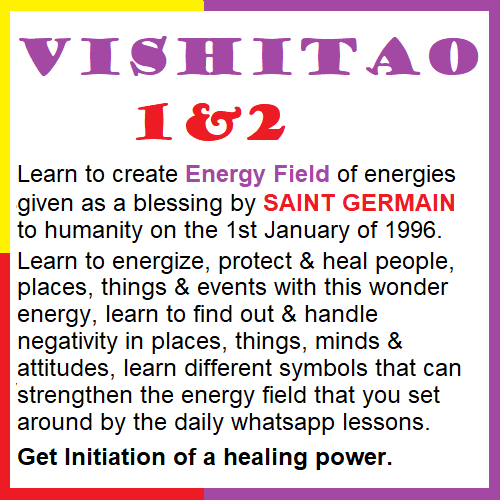 On the last day of the 4 day vishitao session, there is a Guest session and convocation of successful candidates. The successful candidates share their experiences and heal their guests before they are awarded the certificates and Vishitao Master Healer pins. After this workshop, there is a follow up session announced at the end of the 4 day session. In the follow up session, one can share his experiences. and also invite the patients whom one has healed during this period so that these patients can share their experiences. Such follow-up sessions are helpful for the healers to develop greater confidence in healing different things and events, and also help them develop combinations of different techniques in order to produce speedy and powerful healing.